Special events like wedding, anniversaries and fundraisers need attractive dishware, but no one wants to deal with the cleanup. 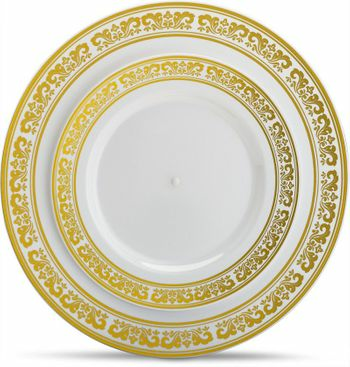 These attractive white plastic plates with elegant silver or gold border look just like fine China, but they don't break when dropped and you don't have to wash them when finished. China like tableware is all the rage don't want to sacrifice a sophisticated look because of ease of cleanup.